My MCAT is fast approaching! Only a few weeks left to cram in as much studying as I possibly can! I'm so nervous! But onto the polish! 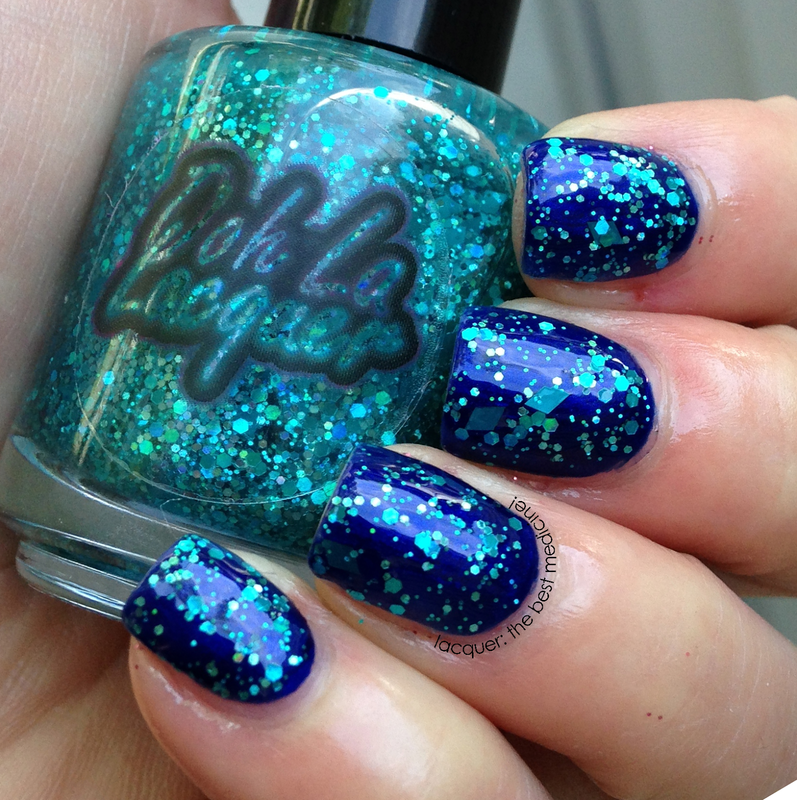 Today I have four polishes to show you from Ooh La Lacquer. First up is my hands-down favorite, Grosky Lil' Beotch. (Mean Girls, anyone!?) Forget that fact the fact that I freakin' love the name of the polish - I also adore the actual polish! Grosky Lil' Beotch consists of blue holographic multi-sized hexes and diamond glitters in a clear base. No complaints on the formula here, or any of these for that matter. They were all packed with glitter, and applied very nicely and evenly. Shown here is one coat of Grosky Lil' Beotch over 10 Professional 465 Starstruck, topped with Glisten & Glow HK Girl Topcoat. Does it get any more GORGEOUS than that!? Here's Princess Nylah, is a pink jelly with multi-sized and multi-shaped pink holographic glitters. I used three coats of Princess Nylah for these swatches; if you are a stickler for smooth nails, you will definitely need topcoat for this one to even it out. I used a coat of Nail Pattern Boldness Glitter Food for smoothness followed by a coat of HK Girl for some supah-shine! Next we have HollaMATTE Girl (I am loving these names!). 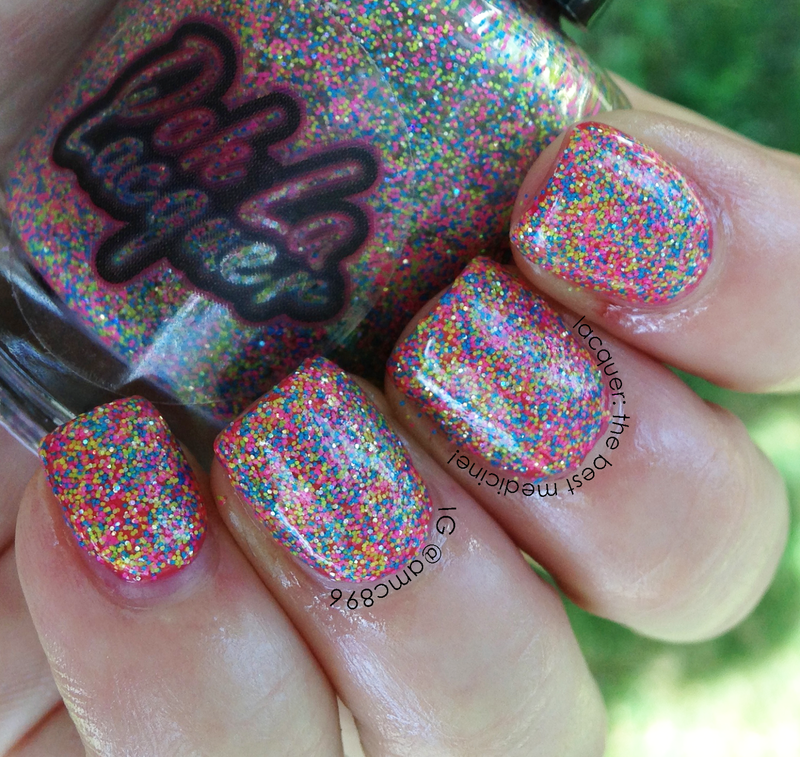 HollaMATTE Girl consists of matte purple, yellow, and neon blue hexagon glitters in a clear base. Shown below is two coats of HollaMATTE Girl over Julep Charlotte. I topped this one off with HK Girl as well. And here's Neonpolitan: LOADS of neon multi-colored microglitters in a clear base. Swatches below show three coats of Neonpolitan over Confetti Cosmetics Fruit Smoothie. Again, I topped it off with Glitter Food followed by HK Girl. Overall, I am really, really impressed with these polishes. They are easy to work with and really beautiful! Here's the kicker: Full size bottles retail for only $8 ($10 for holos, $4 for sale polishes!!) in Ooh La Lacquer's Etsy Shop! What gorgeous colors! I especially love the first one! Blue is my favorite color too! DO IT!! It's so worth it! !